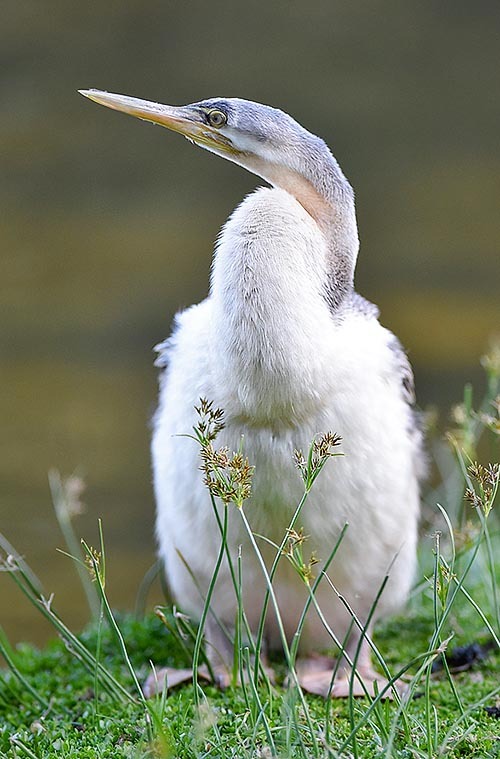 Years ago, the Australian darter (Anhinga novaehollandiae Gould, 1847) was considered as a subspecies of the Indian darter Anhinga melanogaster. These two species are the only ones to have a conterminous range in some points, unlike the other species that have, on the contrary, distant and well separated territories. Still now, various ornithological manuals state that this darter who lives in the southernmost range, is of the same species found in the northern one, but it is nowadays officially accepted by the ornithological world that this is an independent species. 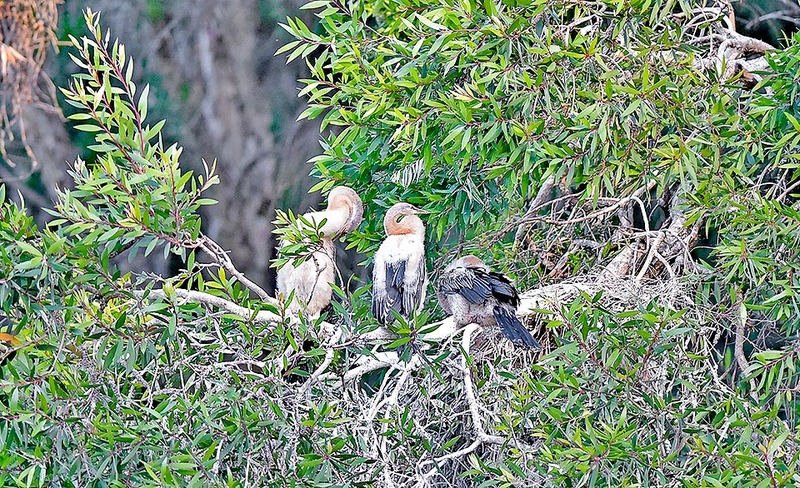 The Australian darter belongs to the order of the Suliformes and to the family of the Anhingidae that now counts, including this, 4 species. Like all anhingids they are recognized due to the particular morphology that renders them easily distinguishable from any other bird, including the cormorants with whom they often cohabit. Bird easy to observe in water when shows the characteristic snake-like neck as well as on the land perched on a dry and floating trunk with the wings completely spread for drying up the plumage. 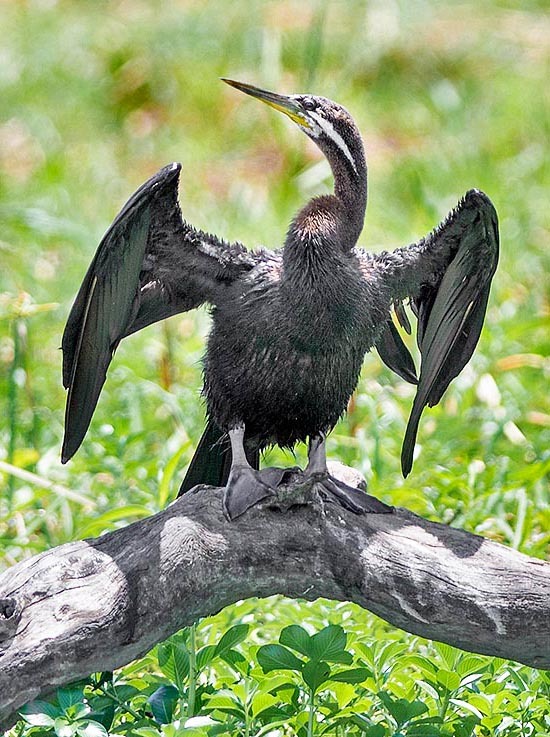 All anhingids have feathers deliberately not spread with the oily fat gotten from the gland situated on the uropygium as do the surface aquatic birds but leave them natural allowing to soak and consequently making the body heavy thus facilitating its immersion. Such behaviour favours remarkably the possibility of remaining immersed but at the same time needs an immediate drying up as soon as the darter re-emerges on the surface. The scientific name Anhinga comes from the eponymous term used in the Tupi Guaranì language, currently spoken in the Amazon jungle, an idiom that has been a reference for many authors in the classification of numerous animal species coming from that territory. The name of the species novaehollandiae is a Latin neologism that resumes that the first Dutch navigators had identified as the territory of the western coast of Australia, the New Holland, rightly to recall their far away motherland. In Europe, for various centuries and until the early ‘800, this was the name given to Australia. Later on, the Brits and particularly the naturalists, had used the same name to indicate also the eastern coast, now New South Wales. As a matter of fact, many species of animals and particularly birds of this brand new world, have this reference in their scientific name. In the Anglo-Saxon world the anhingas are called Darter from dart = arrow or for indicating somebody or something that moves rapidly, in a sudden and darting way. Never a term was more appropriate for this bird that when in the water has an unthinkable ability and nimbleness. The international common names have of course adopted a description that reflects the origin area of this species. In English, Australian darter; in German, Austral-Schlangenhalsvogel; in Spanish, Anhinga australiana; in French, Anhinga d’Australie; in Italian Aninga australiana and a folkloric Oasutorariahebiu in Japanese. Even in the vulgar name give to this bird, Australian darter, is clearly reflected its provenance that concentrates on the whole Australian territory, Tasmania included, in New Zealand where is little present of New Guinea and the island of Timor, two limits, these last, that see a contact with the range of the Indian darter (Anhinga melanogaster and a slight overlapping of some populations. These limits are not of easy identification as it is not known precisely if the two species hybridize besides the fact that in various liveries the two birds may be easily confused each other. It is a sedentary species and the only movements have a seasonal character when the darter moves for short distances looking for new water bodies where often they do concentrate in a good number. The darter is inseparably linked to water and missing it should not have the least chance of surviving. It lives in small lakes and swamps, along rivers with slow flowing waters, in the billabongs, those typical Australian oxbow lakes characteristic of the Kakadu National Park and also along the forests of marine mangroves when placed well inland from the coast. Any water body with a depth over the 50-60 cm, what is enough to allow it the complete immersion, becomes its ideal habitat. In Australia also the small lakes situated at the centre of the wonderful city parks, are often frequented by this bird. This darter spends most of its time in water, where it expresses all swimming capacity and the hunting skill after which it re-emerges and perched on an emerging trunk, spends there hours to warming up in the sun and drying up the feathers. Actually, the darter not only must rehabilitate itself for the flight by getting again dry its plumage, but must recover the heat lost on water in order to avoid hypothermias that might reveal fatal. This operation becomes essential when the outer temperature is not so high as is the case of the southernmost ranges, of course in the Southern hemisphere. All four species of darter have almost the same size, the same shape and the same habits. 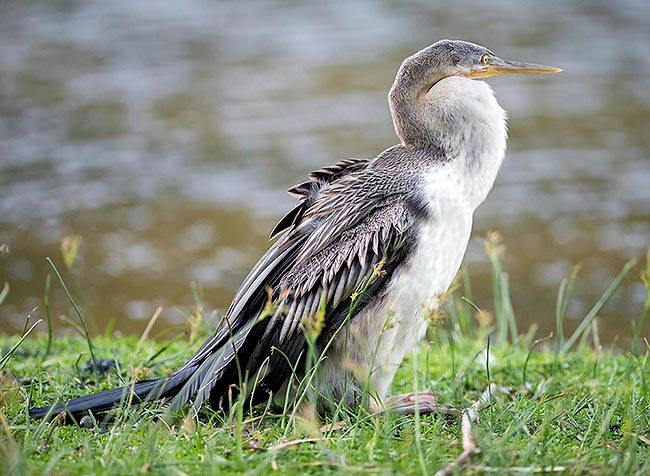 The Australian darter measures about 95 cm in length, has a wingspan of 120/130 cm and a weight of about 1800 g.
Characteristic to these birds is the extremely slender and tapered body that renders them similar, as the English vulgar name states, to a real arrow. Its shape is so stretched and pointed when it swims under water and the speed it can reach is so much impressive to seem a shapeless torpedo ready to hit some target or even to inadvertently collide against the bank of the small lake where it’s swimming but that instead avoids with so much impressive turns to create doubts on any natural law. Such a powerful propulsion can be given only by two huge webbed feet that seem outsized for their dimension. A real machine to navigate under water. 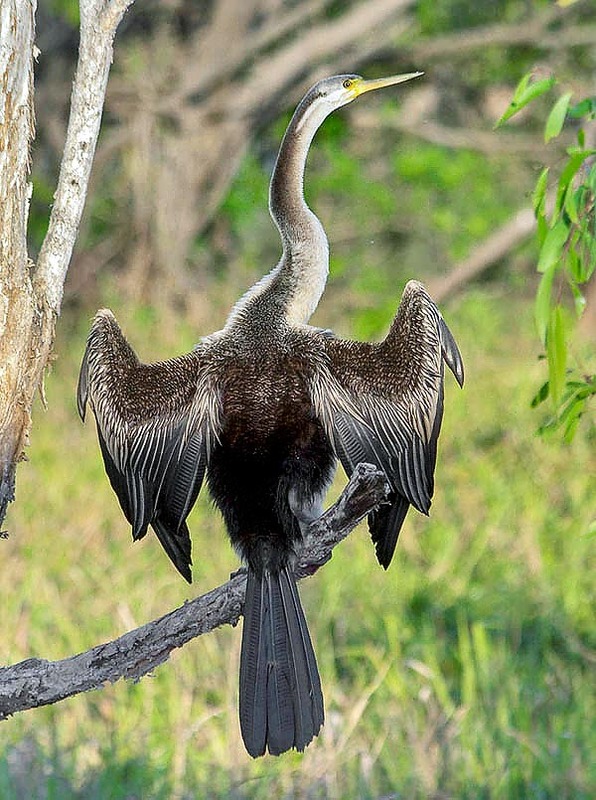 Like all anhingids the livery of the Australian darter is dark and gloomy. The plumage of the back and of the wings is intense black run by thin white lines that give the appearance of a clear mantle covering the shoulders, well visible also from far away. Tha male has the body brownish at times tending reddish like in the Indian darter (Anhinga melanogaster) of which was considered a subspecies, the head is crossed by two wide white whiskers that from the ocular line get down laterally on the neck for about ten centimetres. The bill is yellow and the legs are black. Conversely, the female, the young and also the subadults have a widely whitish livery, streaked more or less diffusely by black lines and spots. Our darter nidifies only close to the waterstreams and does so in colonies at times very crowded together with herons and cormorants. Rather than a well built platform, is done a shapeless tangle of twigs and aquatic grasses that will be the nest where it will lay 3-5 bluish white eggs that will form its hatching. The nest is usually placed close to the water streams, on the lowest branches, close and often hanging on the underlying water. The hatching is done by both parents and lasts about 30 days but the chicks, that are born featherless, will keep in the nest for some weeks even if often while toddling through the branches they abandon the nest well before this term. The sexual maturity is reached after the second year. This darter nourishes of fishes even of medium size it gulps whole and live as soon as fished, but seizes also crustaceans, mollusks, water snakes and amphibians. The Australian darter is widely diffused and numerous in its range and is not considered as an endangered species. Anhinga melanogaster novaehollandiae Pennant, 1769; Plotus novaeholladiae Gould, 1847; Plotus laticeps De Vis, 1906; Anhinga laticeps De Vis, 1906.